Although she shocked some of her Little Monsters recently with a shaved head, Lady Gaga showed up with a waist length turquoise wig as she rehearsed for the Much Music Video Awards in Toronto Canada. Did the Mother of all Little Monsters actually shave her head? Probably not but you never know when it comes to Lady Gaga. Most experts believe she simply donned a skin tight bald cap and her real hair is still intact under her latest striking wig. The good thing about Lady Gaga? We know she will keep changing up her hair so just stay tuned for her next amazing hairstyle. 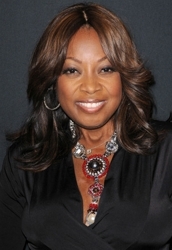 Celebrity Apprentice contestant Star Jones was on Ellen recently to discuss her very public battle with NeNe Leakes. On the most recent episode of NBC’s reality TV show NeNe attacked Star in front of Farouk, one of the corporate sponsors. Star discussed in detail with Ellen her thoughts on the episode, NeNe and how she competes on the show. Star danced with Ellen who noted that the former c0-star of The View was showing a lighter side of herself. Star agreed and said “they don’t let me dance on that show, they just want me to beat up on people. I don’t beat up on people.” Star asked Ellen and the audience if they saw the most recent episode where NeNe attacked her. This beautiful new Spring 2011 collection has seven new wigs, and you can buy them all at Applause:. These stylish wigs are made using the most advanced wig making technology that Hair U Wear has to offer. The inspiration is Raquel Welch herself, whose wigs bring out beauty in every woman who wears them. Lace fronts will give you the most natural looking hairline possible. The monofilament tops are great for medical wigs because of the very secure fit. Monotops also can be worn by anyone, as they give you the more styling options than a normal cap, because you can part the hair in any direction. Applause: a human hair wig. This is a 100% hand knotted human hair short layered cut. It combines the natural looking hairline of a Sheer Indulgence lace front cap for off the face styling, with a cool, light comfort of the Sheer Indulgence monofilament top. All while including the added styling versatility of that you see in all Raquel Welch human hair wigs. Pop star Lady Gaga, aka Stefani Germanotta, has admitted to People.com that her trademark white blonde hair is falling out because of constant dyeing and bleaching. The superstar performer said “I have to get a chemical haircut because my blonde hair is falling out”. Lady Gaga is a natural brunette but has spent many years dyeing her hair blonde. While anything Lady Gaga does with her hair, make-up, body or fashions sets the world on fire, her confession of blonde hair trauma is nothing new. Many celebrities from Paris Hilton to Christina Aguilera have suffered through bouts of hair problems as a result of excessive drying and bleaching. According to an interview with MODERN SALON, celebrity hairstylist Orlando Pita says that Kate Winslet’s hair was cut for the British Vogue cover. Pita, a celebrity hair consultant on Bravo’s recent season of Shear Genius, also noted the Academy Award winner’s hair on British Vogue was a dramatic departure from her former shoulder length, dirty blonde locks. Of course transitioning hair color from dirty blonde to stark white was shocking to fans as was the short choppy hair which many questioned. Did Kate really cut her hair or not? After all, many celebrities over the years have stunned fans with a drastic new length or color only to confess later to wearing a wear, hair extensions or some other instant hair altering accessory. Jessica Simpson famously shocked fans a few years ago by showing up at a red carpet event wearing a drastic new red hair hue. HAIR BRASIL celebrates 10 years in business in 2011 with a record of events, international shows and novelties brought by 800 beauty care brands. The 10 years of HAIR BRASIL – Twitter which will take place from April 2 to 5, 2011, in the city of São Paulo – Brazil, will be celebrated with a mega fair. In addition to the launching showcased by hundreds of brands of products for hair and beauty care, the event is featuring a record number of simultaneous events and of international shows. The show will feature 65,000 sqm of exhibition space in the pavilions of the Expo Center Norte, in the city of São Paulo. 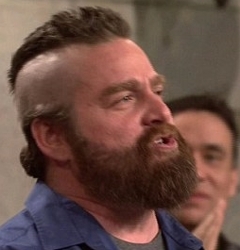 Zach Galifianakis Shaves His Hair Into Mohawk On Saturday Night Light. Or Did He? Zach Galifianakis is zany, wild and crazy. The funnyman will stop at nothing in order to get a laugh. The Hangover star freaked out the live audience on Saturday Night Live when he shaved his own head to entertain them during the show. But did he really shave his head? If you look close it appears Zach might have been wearing a bald cap which he shaved. It certainly looks like the read deal. Posted in bald cap, Body Beat, Celebrity Bites, Celebrity Gossip, Celebrity Hairstyles, Celebrity News, Celebrity News & Juice, Grooming, Hair, Hair news, Hairstyles, Men's Grooming, Men's Hairstyles, Movies & Films, no hair, Ramblings On Current News & Events, Shaved, TV's Picks & Pans, Wigs | Comments Off on Zach Galifianakis Shaves His Hair Into Mohawk On Saturday Night Light. Or Did He? Did Tamara Taylor Cut Her Long Hair Into A Chin Length Bob? Raven haired Tamara Taylor plays Dr. Camille Saroyan on Fox/TV’s Bones. The Toronto native has had a long and successful career as an actress. Just months after moving to Los Angeles from her native Toronto, she booked parts in both television and film. Unfortunately Taylor had a very small part in the Blackout episode. When she appeared briefly on screen her hairstyle was a classic chin-length stick straight swingy bob with a side-swept fringe. Tamara wore her hair pulled back from a center part and pinned up into a faux short hairstyle at the 2010 Fox All Star Party on August 2, 2010 at the Santa Monica Pier, Santa Monica, California. I had a very hard time trying to figure out if Tamara had cut her hair into a medium length bob, was wearing a wig or had her hair pinned up. It was disappointing Tamara had such little screen time in which to discover the true story on her new much shorter hairstyle. If I had to guess I would say Tamara was wearing a sleek bob lace front wig. It looked very chic. However, it’s possible she actually cut her hair. The only way to tell for sure is to see how Tamara wears her hair in future episodes of Bones. Taylor made her feature film debut as Marlon Wayans’ love interest in the romantic comedy “Senseless” starring David Spade and Rip Torn. Please follow me on Twitter at: http://Twitter.com/HairBoutique. I look forward to meeting new people from all walks of Twitter and learning from their Tweets. Visit us at Hairboutique.com located at: http://www.HairBoutique.com, on Facebook, MySpace and YouTube. Even as the stars were strolling down the Red Carpet at the recent 2011 Academy Awards fashionistas were frantically scribbling notes. Not only were they trying to get all the details about the gown, the jewels, the hair, make-up and shoes, in some cases they were working for companies who are knocking off the gowns. Did you read that right? Yes indeed. As recently reported on NBC’s Today show, Red Carpet gowns are evaluated for convertibility to the general public and then instantly copied for Proms, weddings and other special events. Some of the dresses can already be ordered and will be delivered in a matter of weeks. This information is noteworthy because outfits like Jennifer Hudson wore added up to a cool million dollars for the gown and the accessories and the converted knock-offs usually retail in the hundreds rather than the thousands. Meanwhile on the hair front, converted Red Carpet hairstyles are key for Spring Prom and Weddings.